How are you keeping in touch with your customers and prospects? Social media, mobile texts, and blog comments are great, but nothing compares to email marketing. In B2B, email is the 3rd most influential source of info for prospects. And then the clickthrough rates for B2B email is 47% higher than B2C campaigns. But this isn’t to suggest that email doesn’t work for business-to-consumer brands. Roughly 80% of retail professionals say email marketing helps them retain customers. And B2C email subscribers spend 138% more than those that aren’t subscribed. So there’s a lot of value in email marketing for both types of companies. The next question now is when’s the best time of day to send out those emails? Well, we’ve got some data for ya. 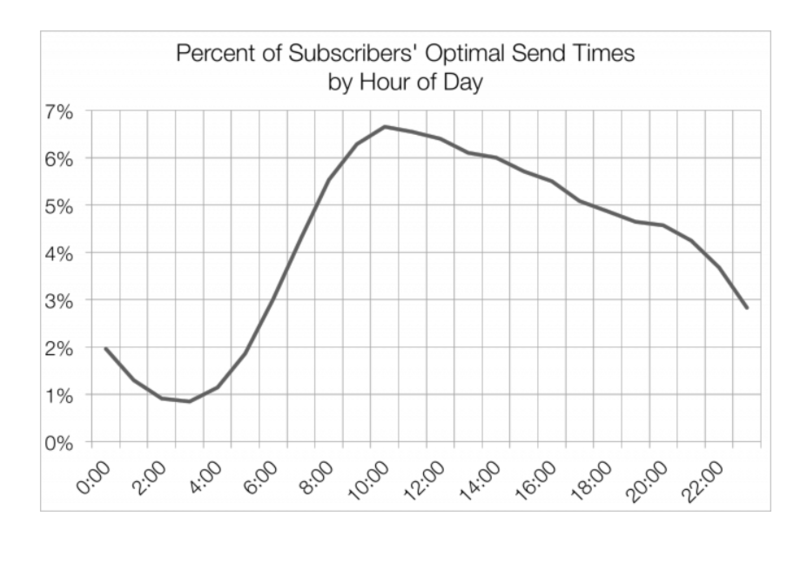 The best time of day to send emails varies depending on the data you use. 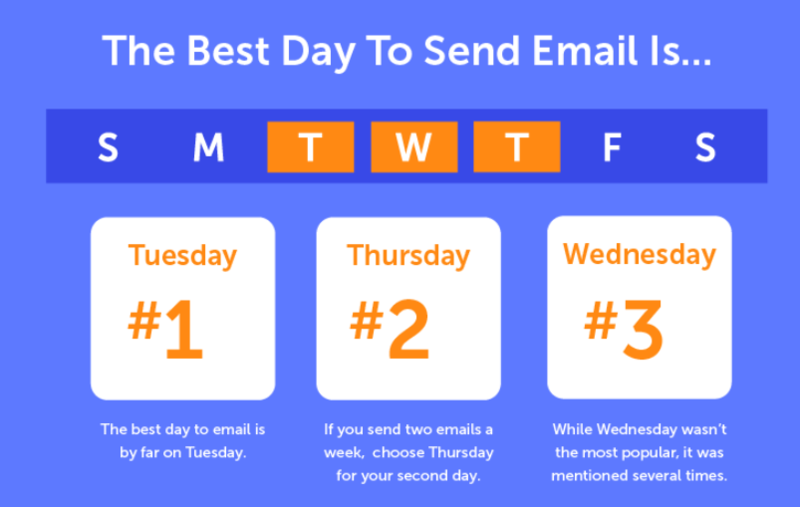 According to Hubspot’s report, the best days of the week for marketing emails are Monday, Tuesday, and Wednesday. Both Monday and Wednesday were tied at 18% open rates, while Tuesday trumped both at 20%. Then when we look at Co-Schedule’s data, you’ll find something slightly different. Where both reports agree is that Tuesday is the best day. But the second best day is Thursday, followed by Wednesday. Oddly enough, you’ll find that Mailchimp’s report disagrees with both, showing that Thursday is the best day with an 18% open rate. The next best days, according to them, are Tuesday and Monday. 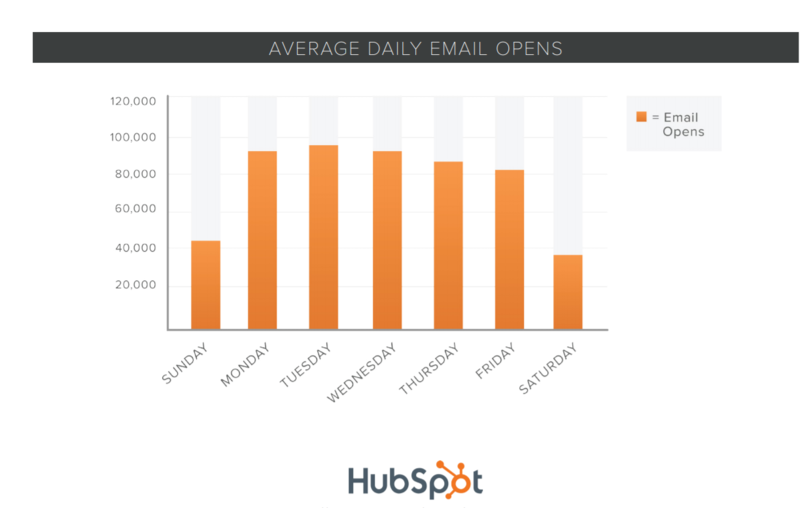 Now, when it comes to weekends, Hubspot states that engagement levels drop throughout the week and into the weekend. However, if you want to send emails over the weekend, then Sunday would be your best bet (at -82% — yes, that’s a negative). What About the Best Time of Day? We can probably agree that Tuesdays and Thursdays should be your top picks if you send out emails twice per week. But what about the time? 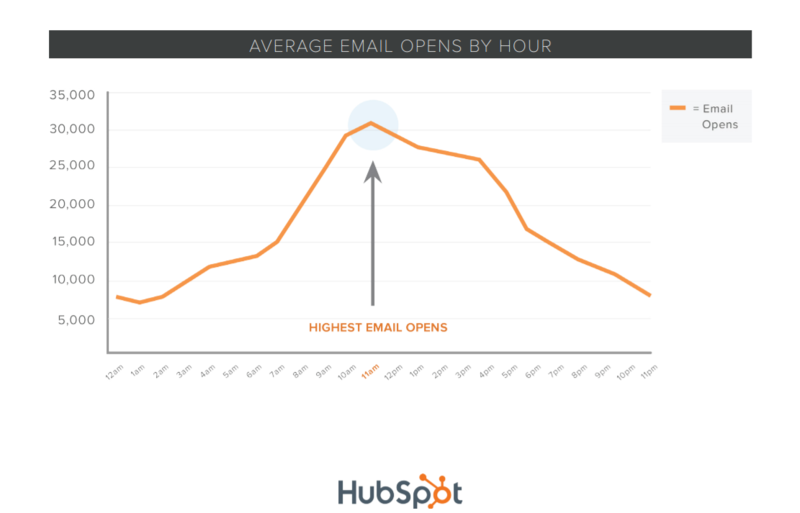 In Hubspot’s report, it shows that 11 am EST is the optimal time to send out emails. So based on their stats, Tuesdays at 11 am is what to aim for. It also shows this is the golden rule throughout the week (except for Sundays). 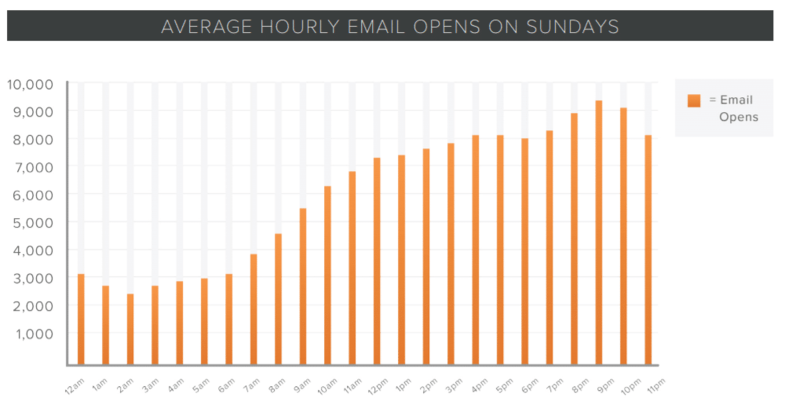 Sundays show a 35% higher open rate when you send emails at 9 pm. Now, if we go over to Co-Schedule, we’ll find that the optimal time of day to send emails is 10 am. Second runner up is 8 pm, followed by 2 pm and 6 am. Here’s the breakdown of their data. It appears Mailchimp’s report votes in agreement that 10 am is indeed the best time of day to email (but in the time zone of the recipient). 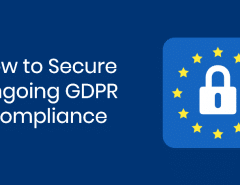 They also advise against sending emails in the wee hours of the morning, such as 3 am and 4 am. And that it’s a good idea to use a “delivery by time zone” feature to ensure your recipients are receiving emails at the proper time based on their time zone. We also see the same thing for people across the world. For instance, in Spain, the optimal times are 10 am and 11 am. But since Norway has long summer days, they tend to have higher engagement well after business hours. Then when we look at Egypt, we find that pre-dawn hours are the best. Alright, so what did we learn? 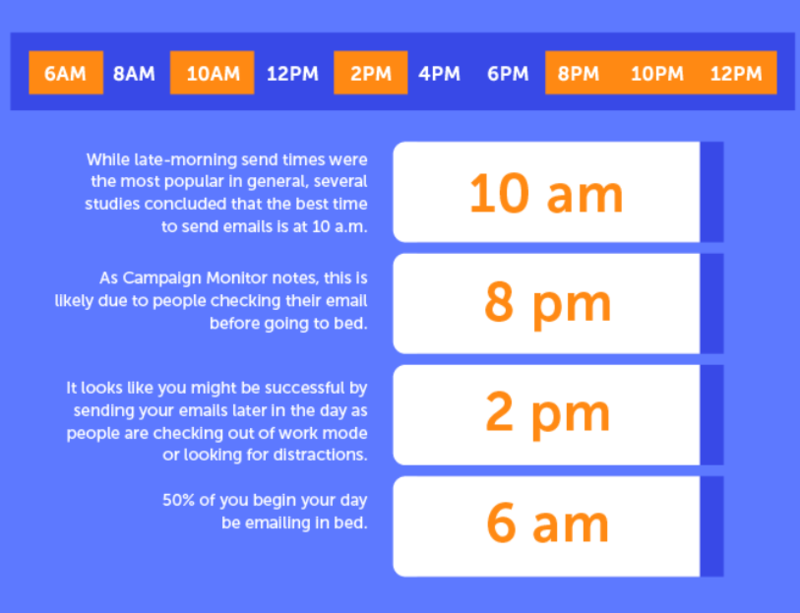 We learned that the best time of day to send emails are between 10 am and 11 am throughout the week and 9 pm on Sundays. And if you have to pick two days out of the week, it should be Tuesdays and Thursdays. But it also depends on where your recipients are in the world. 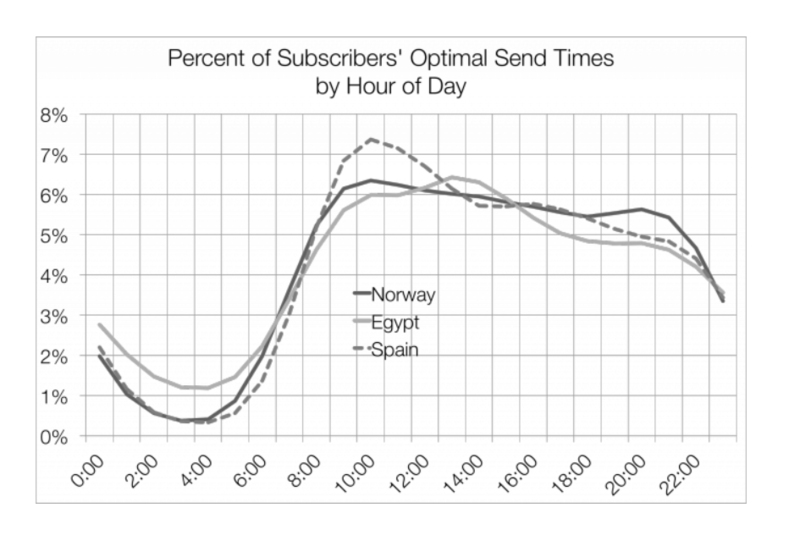 For example, if you have subscribers in Egypt, then these times aren’t ideal since they have higher engagement early in the morning. What About Sending Emails Over the Holidays? So can we apply what we learned to email campaigns that run through the holidays? Great question. Hubspot has some answers. They conducted an analysis based on emails sent from popular American holidays, such as Thanksgiving, New Year’s, Christmas, Veteran’s Day, Memorial Day, and 4th of July. Let’s begin with Thanksgiving. When they analyzed the open rates the Wednesday before Thanksgiving, they saw a drop by 6%. And the engagement rates declined more and more until Monday. We also find that the daily average email opens rose significantly to 106% after Thanksgiving all the way to Wednesday. So if you’d like to get the best engagement during this holiday, then you should aim for the Monday before Thanksgiving and Tuesday or Wednesday following T-Day. The Christmas season likely appeals to you because it’s when most B2C businesses earn most of their annual revenue. Well, good news — email opens are 6% higher the week before Christmas (likely holiday shoppers looking for last-minute deals). Then starting around Dec 22, the decrease in open rates continues until after New Year’s. So how much of a decrease did they see? Well on Christmas Eve, the engagement rate decreased 42%. And it increased to 72% on Christmas Day (for obvious reasons). This continues the week after Christmas with 33% and 35% decreased open rates for Dec 29th and Dec 30th. Is New Year’s Any Better? 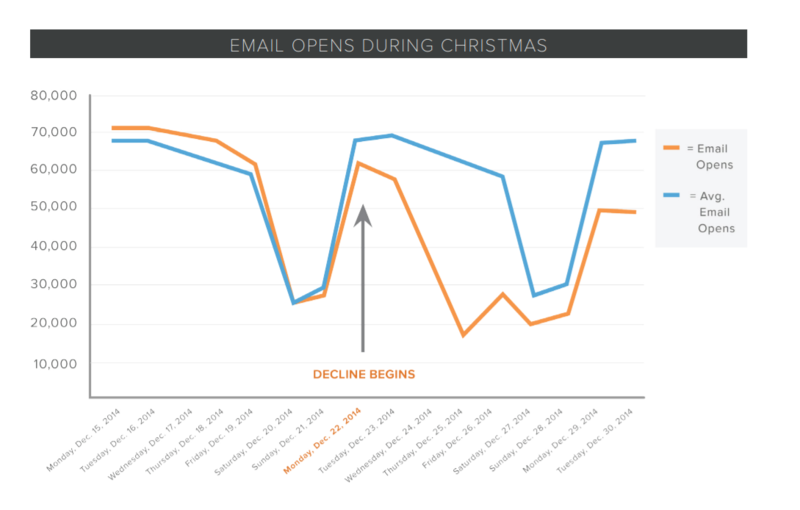 We saw a drop in email rates after Christmas, leading up to New Year’s and onward. 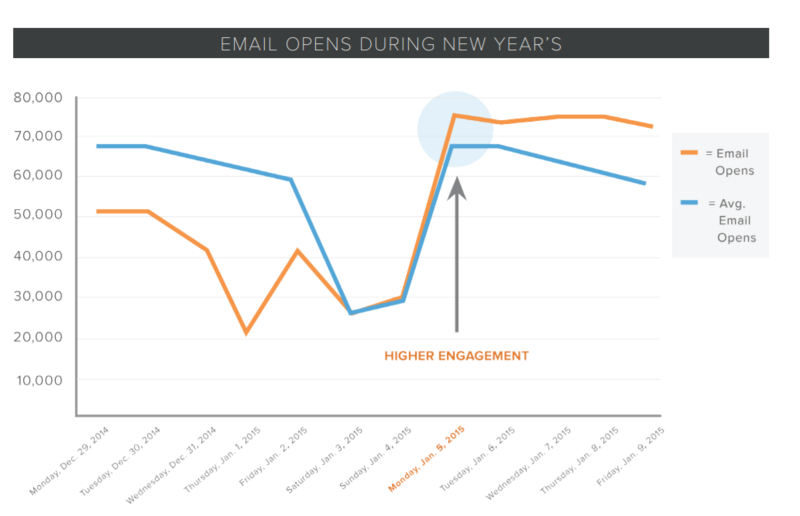 According to this Hubspot chart, email opens decreased 37% on New Year’s Eve and 62% on New Year’s Day. So when does it get back to normal? Well, we see that the engagement rate increases by 12% around Jan 5th (a Monday). Then Thursday hit a peak. 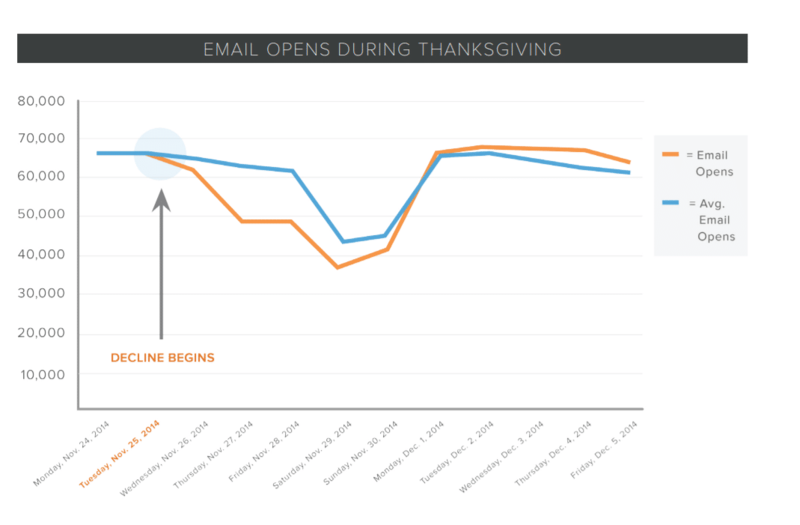 Alright, so we see a major difference between the holidays and the rest of the year for email marketing. 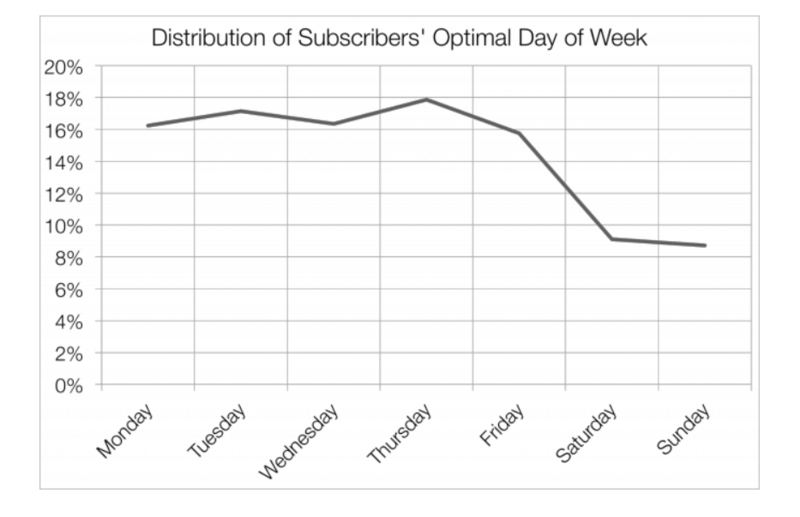 If you’re looking to send out marketing emails to subscribers, then it’s best to get it out as early as possible (at least a week in advance). The day the holidays fall on will determine when you can expect the email engagement rates to bounce back. You can expect it to be around the first Monday after Thanksgiving or New Year’s when people get back to work. Now, should we take this data and make it the be all end all for email marketing? In fact, we highly recommend you experiment with your campaign to see what works for you. You may find your audience has a different schedule than the average person in your country. The best way to handle this is to create segmented campaigns and then A/B split test each of the emails you send out. Send email batch A on a specific day and time and then batch B on a different day and time. It’ll take a few months to start to see a pattern. But once you do, you’ll be able to improve your email marketing efforts. So what happens after your subscribers open up their emails? The next step is to get them to read and engage with what’s inside. For example, if you include a link, you want them to click on it. Or if you have social media share buttons, then you want them to click those. This too will require experimentation to see what works. One option is to change the layout — maybe more visuals will help attract and engage them. You can also test the engagement with the plain text and visual (HTML) emails. Most brands think the HTML layouts are better because they’re more appealing. 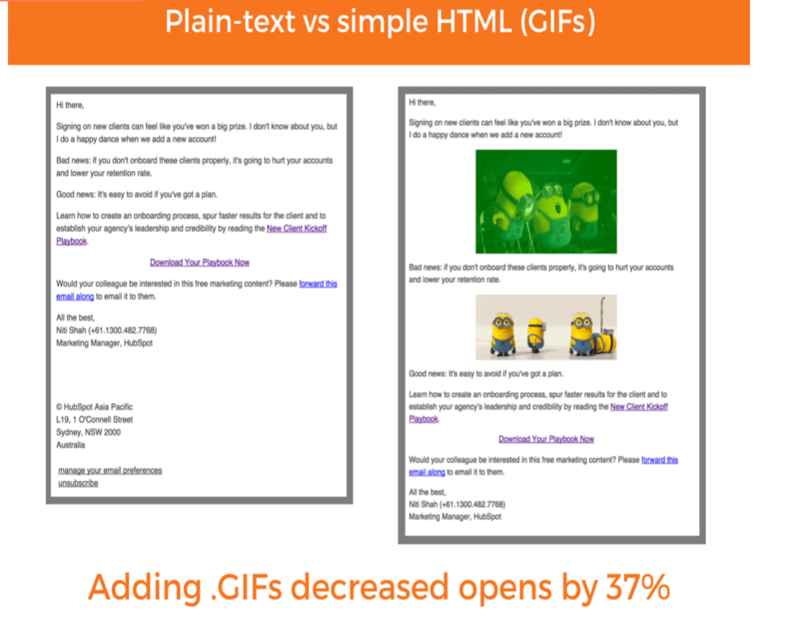 However, Hubspot research shows that they decrease open and clickthrough rates. So planning your email campaigns isn’t always clearcut or simple. The only way to achieve the best engagement is to test and identify what your audience likes. Ready to Start Your Email Campaign? Or maybe you need help building your email list of subscribers. If so, there are tools you can use to help drive more subscriptions. Poptin is a platform that’s simple to use — plus, there’s a free version you can try today. 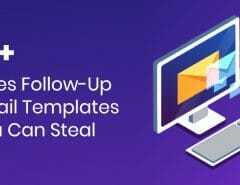 Sign up and get started crafting opt-in popups that capture leads before they leave your site, reach a particular area of a page or other parameters you set up. Once you’re ready to get rockin’ with your email campaign, you can use the data here as starting guidelines. Already started testing your campaigns? Let us know in the comments what you’ve learned!